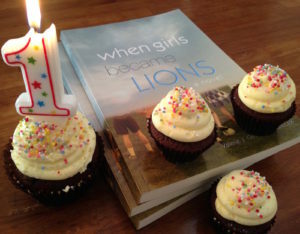 Grab a cupcake and celebrate: WHEN GIRLS BECAME LIONS turns 1 year old this month! And what a year it’s been! Val and Jo are grateful for all the amazing feedback, media attention and reader responses, like this one: “I couldn’t put the book down. It reminded me of so many sacrifices so that my daughters could have the opportunity to play. Thank you to all the unsung heroes!” Thank you indeed!